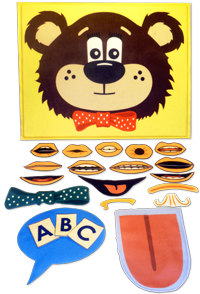 Creative Speech Products is the home of Teddy Talker®, an innovative tool designed to promote early articulation skills with the connection to print. The Teddy Talker® Bear and materials are specifically created to build an auditory, visual, tactile and kinesthetic system for learning about sounds. Phonemes and graphemes are connected in a fun-filled way, and make learning visible, tangible and engaging for young children. Watch the video below to see how easy and interactive learning with Teddy Talker® can be! Check out the research constructs upon which the Teddy Talker® system is designed. You can use Teddy with Common Core State Standards! • CCSS.ELA-Literacy.RF.K.1B: Recognize that spoken words are represented in written language by specific sequences of letters. • CCSS.ELA-Literacy.RF.K.1.d: Recognize and name all upper- and lowercase letters of the alphabet. • CCSS.ELA-Literacy.RF.K.2d: Isolate and pronounce the initial, medial vowel, and final sounds (phonemes) in three-phoneme (consonant-vowel-consonant, or CVC) words. • CCSS.ELA-Literacy.RF.K.2e: Add or substitute individual sounds (phonemes) in simple, one-syllable words to make new words. • CCSS.ELA-Literacy.RF.K.3a: Demonstrate basic knowledge of one-to-one letter-sound correspondences by producing the primary sound or many of the most frequent sounds for each consonant. • CCSS.ELA-Literacy.RF.1.2c: Isolate and pronounce initial, medial vowel, and final sounds (phonemes) in spoken single-syllable words. • CCSS.ELA-Literacy.RF.K.3b: Associate the long and short sounds with the common spellings (graphemes) for the five major vowels. Visit the Teddy Talker® product page here! Creative Speech Products is the home of Teddy Talker™, an innovative tool designed to promote early articulation skills with the connection to print.